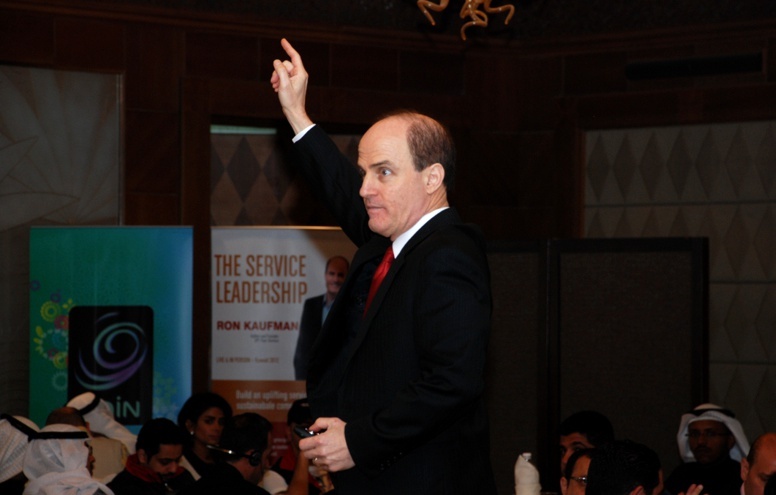 Vigor-Events hosted Ron Kaufman, the world’s leading customer service speaker, educator and motivator for uplifting customer service and building service cultures. Ron is the author of the New York Times bestseller Uplifting Service and 14 other books on service, business and inspiration. Rated one of the world’s “Top 25 Who’s Hot” speakers by Speaker Magazine, Ron has powerful insights from working with clients all over the world in every major industry for more than twenty years. Ron gave an interactive lecture in Kuwait, where attended more than 250 people from various segments of Kuwaiti society which was held on Tuesday, December 18, 2012 from 9 until 5 pm at the Holiday Inn Salmiyah Hotel. During the Seminar, Ron outlined pivotal elements of respectful leadership and provided insights for leaders who want to improve both their personal and organizational customer service. The last thing a customer with a complaint wants to hear you say is: “You’re wrong.” What they want to hear is that you understand them, appreciate them, and agree with them on the importance of the value they have cited in their complaint. Satisfaction is the least that is expected. Is that the least you can do? Make money today and you will do well today. Make money pleasing customers today and you will also do well tomorrow.